Devoid have come out with a 4 song EP this year. Their debut 'A God's Lie' was a brilliant piece of Thrash / Death Metal and it bagged the Best Album Award at the Rolling Stone Metal Awards 2011. So how does 'The Invasion EP' live up to such an accomplished predecessor? Devoid is a four piece Thrash / Death Metal band from Mumbai, India. They are well known in the local circuits for their energetic live performances. 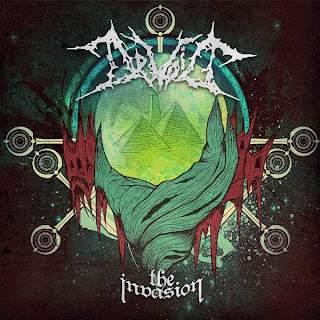 Their latest release 'The Invasion EP' was released on 3rd February, 2013. This EP begins with a hauntingly atmospheric, acoustic intro, which sets the perfect tone for an invasion of the Earth. With the start of the track, 'The Invasion', the album thrusts forward on top gear. A fast and blistering track, it is filled with thrashy guitar riffs and a blistering double bass attack that has the clear intention of ripping your face off. The vocalist has a distinct and unique vocal style. His vocal style sounds like a high pitched growl and it works really well with the overall sound. The guitars are handled really well with the memorable riffs. Though I felt that the guitars could have been a little louder in the mix. The song structures are well written with tempo changes and pace shifts making the songs engaging and adding a touch of progression to the overall sound. The second song 'Pandemonium Is Now' is aptly titled, as it is an all out brutal attack on the listener's senses. I can imagine the crowds moshing away to the riffs on this song. But the best song on this record is easily, 'The Brahma Weapon'. This band released their first professional music video to this song, and it is absolutely killer. The track is overdosed with relentless aggression and high energy riffs. Just as the album closes and you get the feeling that you have got everything that Devoid have to offer, they stun you with 'The Grand Design'. A slower and more melodic track packed with a lot of groove, this song is a killer. One cannot help but headbang to this track. Devoid completely deliver what is expected from a Thrash / Death EP. Buy this monster of an EP and mosh away.